Sylvia’s career has spanned the public and private sectors, as before gaining her nursing qualification as a mature student, she was a director of a family business. She worked for Wolverhampton NHS Trust (1981-2000), firstly in General Nursing, then a Health Visitor, and finally as a member of the Health Care Management Team, helping to shape NHS policy. Commissioned into the Army Reserve as a Nursing Officer in 1987, Sylvia was a member of 202 (Midland) Field Hospital (V). She served in both Gulf Conflicts. On leaving the NHS, she took up the post of West Midland SaBRE Campaign Director (Supporting Britain’s Reservists and Employers), an MOD appointment. 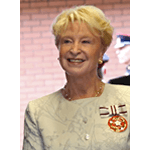 Sylvia was a Magistrate, Chairman and Family Panel Member on the Wolverhampton Bench from 1991 until she retired in 2015. She continues as an Associate Hospital Manager (1983 Mental Health Act Appeals) for the Black Country Partnership NHS Mental Health Trust and is a Panel Member for the Wolverhampton Youth Offending Team.